Dipping dessert items into liquid nitrogen right before consumption can cause severe injury and should be avoided. 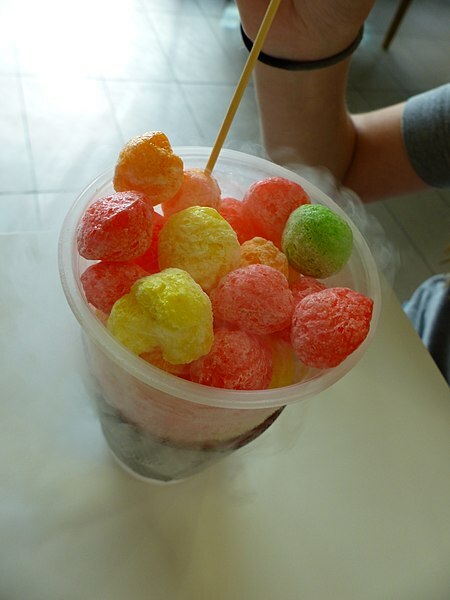 A trendy dessert called Dragon Breath, Heaven’s Breath or Nitro Puff that consists of a cereal snack that taste like fruit loops dipped into liquid nitrogen right before consumption is being sold at malls, fairs, food courts or ice cream parlors. When you eat the dessert your mouth smokes like a dragon which makes for some cool Instagram pictures. However liquid nitrogen even though it is not toxic can cause severe injuries if not handled proprely because of its extremely low temperature. It can be as cold as minus 320 degrees and if it is still present in the food when someone ingests it it can cause severe burns to tissues. Not only fingers but the mouth or the throat and even the stomach can be burned. Last year a 14 year old had to be hospitalized after burning her thumb. In India a man who swallowed a cocktail with liquid Nitrogen too quickly ended up at the emergency room with a hole in his stomach. Additionally people may also experience problems with breathing especially those who suffer from asthma. In the video below a mother explained how her son, 20 minutes after ingesting a few dragon breath treats at a fair went into a full blown asthma crisis and had to transported to the hospital to be treated. Last August the Food and Drug Administration issued a Safety Alert and advised consumers to avoid eating or drinking any type of products using liquid nitrogen at the point of sale. Food products that contained liquid nitrogen but that are prepared prior to the point of sale are generally safe because they are treated in a way that results in a complete evaporation of the liquid nitrogen before the consumption.